Requirements : Must have LH4 Instance access. Level 95+ Transcended class only. Remark : No late comers. Die at your own risk. EXP loss map. Loots is free for all. Must have access to the instance. Mandatory. If you want to have some fun, this is an event for you. If you're here for the loots, this might be the event for you. BUT, if you value your EXP, skip this. No warping into the instance if you do not have access. Training Edition allows no outside gears and few outside items. Details can be found here. 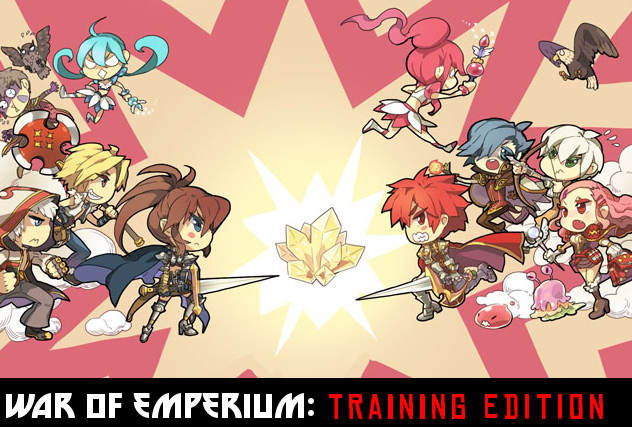 The War of Emperium is a game feature that allows guilds to fight in order to conquer a Castle to be the headquarters for the guild. Owning a Castle gives your guild some exclusive benefits. Every night at Midnight server time, 4 or more (depending on the economy of the castle) treasure boxes will appear in the castle giving useful items and equipment. There is also a special Guild Dungeon accessible to everyone in the guild. These dungeons have several strong monsters that in some cases do not spawn in the normal world. TE system is currently in open beta testing for balance. Godly drops (from castle treasure) and God Items Quest 3 are not implemented. Transcendent (Rebirth) classes cannot enter Non-Trans castles. Requirements : Any class/level. Willing to explode and sacrifice your soul. Remark : No late comers. There will be 10 rounds. For every round you survive you get a point. Person with the most points wins first, second most gets second, third most third and everyone else collects a consolation prize for letting me explode you to pieces. Use of these will forfeit your point for that round. Continued use will remove you from the game.